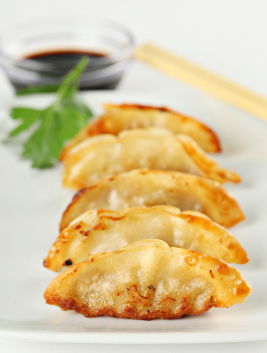 There are some things that just seem too daunting to make from scratch, and far easier to order in: potstickers, if you haven’t made them yourself, can be one of those things. The truth is, they’re far simpler to make from scratch than you might think. And if you have little fingers around that need occupying, they will most likely be happy to sit around the kitchen table for an hour and assemble little dumplings that you can then cook on the stovetop until golden-bottomed and crisp, or freeze in zip-lock bags to pop into simmering chicken stock with noodles for a quick wonton soup.